Throwing the Bouquet: Is It a Must? The tradition of a bride throwing her bouquet dates back to sometime around the 14th century. It began as a way of keeping guests from trying to grab parts of the bride’s dress for luck. Today, it is still a fun tradition with the single ladies waiting to catch the bouquet as a symbol that they’ll be the next to be married. While this can be a fun part of a wedding, many brides want to keep their bouquets as a memento of their wedding. With so many beautiful preservation methods available, the bouquet can be a special addition to your wedding photos. One way to achieve both is to have a second bouquet for the toss. This is often referred to as a “fortune bouquet” and is a smaller version of the main bouquet. It can also be the same as the bouquets the bridesmaids carry. 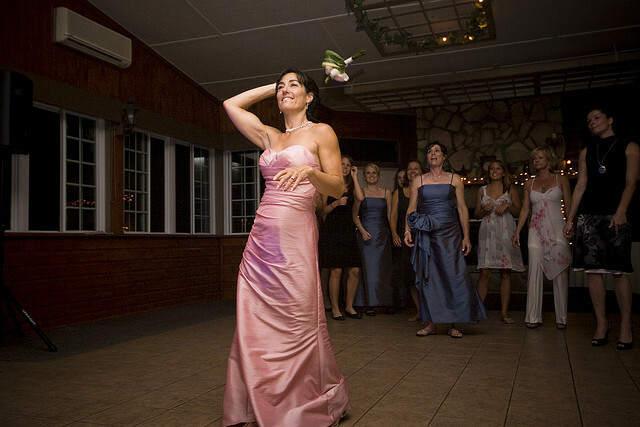 Throwing this bouquet allows you to have the fun of the toss without losing or damaging your own bouquet. To find out more about creating a fortune bouquet, or how to work this tradition into your wedding, give us a call or come by our West Allis florist shop today!